Delay in posting Mergs as a free title today (September 7, 2013) | Victor D. López, J.D., Esq. 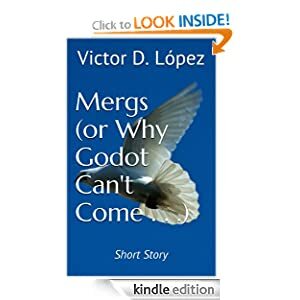 As I posted yesterday, my Kindle title Mergs (Or Why Godot Can’t Come . . .) is free today from Amazon for one day only. Unfortunately, as of 9:37 a.m. EST, the title is not yet available for free download for some unknown reason. I’ve contacted Amazon but they tend to be slow to respond. I’ve verified that the giveaway is supposed to be live today and hope Amazon will correct the error as soon as possible. I apologize for any inconvenience and hope that Amazon will remedy the issue quickly. Just in case Amazon does not resolve the issue quickly, however, I’ve also added another free promotion day for tomorrow. Therefore the title should be available for free download both sometime today, when Amazon fixes the error, and tomorrow. Again my apologies to anyone who tried to download the title and noticed the free promotion was not yet live. The link to the short story is here: Mergs.